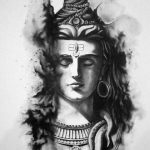 Worshiping Lord Bhairava on Ashtami Thithi & Rahu Kalam with pepper lamp is considered to be more auspicious and brings prosperity in business, work and also helps to get rid off of Black magic and health issues. Its considered to be more auspicious to worship Lord Bhairava by lighting the following Lamps. Take 27 black peppers in new & clean white cloth and put a knot to use this as Thread for Lamp. Dip the pepper with cloth in Gingelly oil overnight. The Next day (Pooja Day), During Rahu Kalam, Take a Coconut. Break the coconut into two parts. Place the cloth along with pepper and oil inside the coconut lamp. Then light the lamp in front of Lord Kala Bhairava during Rahu Kalam. After lighting lamp, chant Kalabhairavastakam with bhakthi. Lit the Deepam in front of Lord Bhairava of any temple. 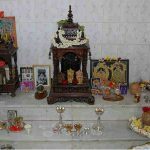 Best timing for worshipping Lord Kalabhairava and lit pepper lamp is Rahu Kalam. Best Day for worshiping Lord Bhairava is Ashtami Thithi. 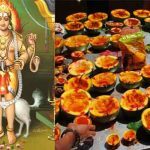 Theipirai Ashtami considered to be special for Bhairava. 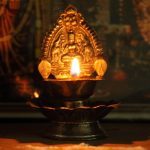 Instead of Mud Deepam, you can use Poosanikkai / Pumpkin Lamp, Coconut for lighting Pepper Lamp. Its considered to be more auspicious. Click on the following links for Kalabhairavastakam & Kalabhairavashtakam Benefits. 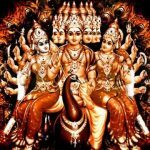 How to perform Skanda Shasti Puja at home? 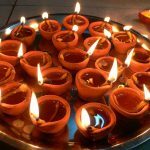 Which type of Lamp / Deepam is Good? How many Lamps to Light in Pooja Room?